Giovanni Battista Pittoni was one of the leading representatives of 18th-century Venetian painting. He trained in his native city with his uncle Francesco and perfected his style by studying the work of contemporary painters such as Nicola Grassi (1682–1748), Antonio Bellucci (1654–1726) and Francesco Solimena (1657–1747). His work reveals the marked influence of the French Rococo, which art historians have attempted to explain as the result of a hypothetical youthful trip to Paris in 1720 in the company of his uncle and of Rosalba Carriera (1675–1747), Giovanni Antonio Pellegrini (1675–1741) and Antonio Maria Zanetti (1706–1778). It has also been suggested that this French influence could have reached Pittoni via painters such as Sebastiano Ricci (1659–1734) and Pellegrini. A large number of paintings and drawings by the artist have survived, and in contrast to other artists of his circle Pittoni remained in Venice, executing numerous public and private commissions for churches and foreign courts in his own studio. The present canvas has been dated to the mid-1720s by Zava Boccazzi. The composition, figures and colour are characteristic of Pittoni’s style, and he repeated this composition and reused the models in numerous canvases on the subject of the Nativity and the Holy Family. In this version the low viewpoint suggests that the painting was intended to be hung in a elevated position. This canvas contains all the elements that made Pittoni a popular artist, particularly with German, Polish and Russian clients: the brilliant lighting that unifies the composition; the elegant, luminous colours with the juxtaposition of delicate blues, pinks and whites in the figure of Mary and yellows and cool blues in the figure of Joseph; the solid modelling of the faces; and above all the elegant gestures and movements of the hands and bodies, which make this particular canvas a reference-point in the artist’s work. A canvas with a similar composition is to be found in the Molinari Pradelli collection in Bologna. 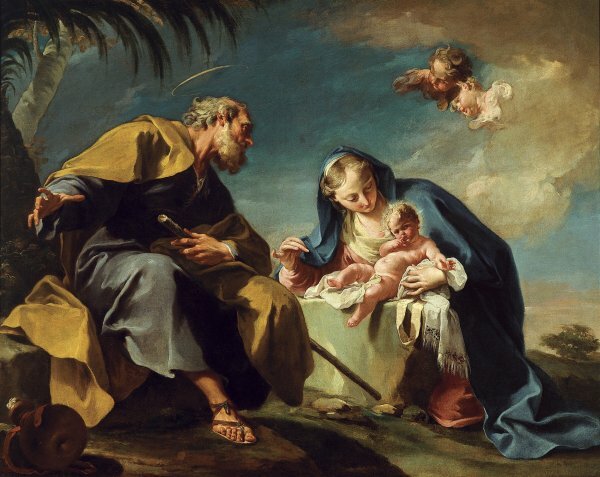 In it, Pittoni again depicts the Holy Family on their flight into Egypt, but the composition is reversed and there are various new elements such as the position of the Christ Child in the Virgin’s lap, the presence of two more little angels and the landscape background, which differs from this one. A drawing in sepia and wash in the Szépmüveszeti Múzeum in Budapest offers a more interesting comparison as it is an exact reproduction of the present work. The drawing is by the Bohemian painter Anton Kern who is documented in Venice between 1725 and 1735 and who was in Pittoni’s studio, first as an apprentice and later as an assistant. Two, small-format autograph replicas of the present canvas are also known. The painting was acquired in 1976 for the Thyssen-Bornemisza collection from a private collection in Milan. It was included in the Collection’s catalogues from 1986.